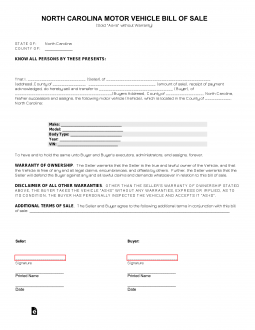 The North Carolina Bill of Sale Forms are used to prove a legal sale and purchase has been transacted between parties. The documents provide information about the seller, buyer, prove change of ownership and will provide identifiers with regard to items being sold and purchased. Some forms will require notarization. Boat Bill of Sale – Legally required in order to transfer the title and for the new owner to obtain registration and stickers for the vessel. General Bill of Sale – For any type of personal item that is to be bought and sold. Gun Bill of Sale – Acts as a receipt for the transfer. Vehicle Bill of Sale – Required to prove a sale for personal records and for obtaining registration from a DMV office. If a lien holder has your vehicle title, then you must present your current out-of-state registration and an odometer reading. If there are co-owners of the vehicle, all necessary documents must be presented or filled out for both owners. A lien release (if applicable).